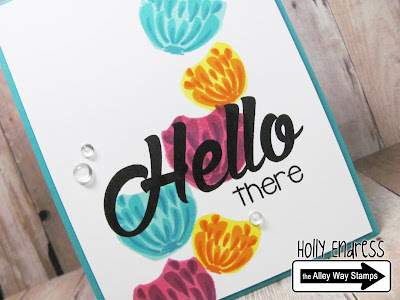 I'm back with another project today using the Alley way stamps sets Sweet Thing and Wispy Wishes. These flowers have two parts in this set but I wanted a third so I took the larger of the images and I stamped on the back side to give a solid outline. Then I preceded to stamp each part in a similar color of ink. 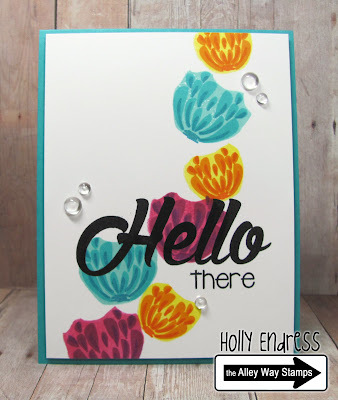 I stamped the Hello there from the Sweet Thing set using some Wplus9 Black Ink. I trimmed a 1/4" off the panel on all side and adhered it to a Turquoise top folding card base with some dimensional adhesive. Instead of my signature Sparkling clear Sequins...I added a few of these Clear drops from Pretty Pink Posh, I think I may have a new fav embellishment. 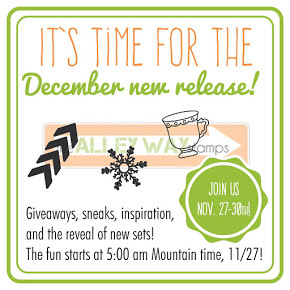 Head over to the Alley Way Stamps blog for more fun inspiration!! !